i think we need more analog in our lives, don't you? the world would be a better place. we'd write things down more, walk a little slower, listen a bit more closely, and take some more time to pore over inspiration and memories instead of filing everything away in an invisible desktop folder. 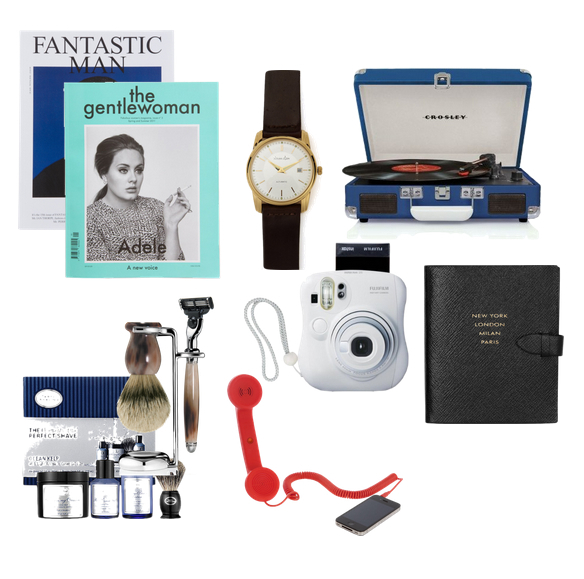 this gift guide is dedicated to the thoughtful luddite in all of us. Ah, I've asked for a Skagen watch for Christmas! I think maybe a classic shaving kit would be excellent for the man in my life. indeed! an old-school shaving kit was the first xmas gift i got for my boyfriend. he's been hooked ever since! AH YES. why are you so good miss sophie!? haha - thanks! these are all items i love! Notecards and beautiful stationery would make a lovely "analog" gift, I think. I just recently wrote a post on my blog on how I miss receiving and writing letters. I have boxes of Crane & Co. and Isabel Gatuslao (a local brand) note cards that are begging to be written on and sent out. I looked at this list and it hit me that I've been hard-core analog without even realising I'm one. I would be lost without the first four items on your list. ah, i think doing things the analog way brings a higher quality of life - i'm glad we're of the same mind here! The Art of Shaving products made me smile. I always put a kit in the gentleman's stocking- he loves it.